Balancing your mental and physical well-being is far from a simple task... and preventative health measures are key. Somawürks by Jay provides a realistic and cost-efficient way of limiting the damaging side effects associated with ergonomically challenged work environments and sedentary lifestyles. To learn more about Jay please visit his professional biography below. You know the old adage, "you're only as strong as your weakest link." Well, it's true - and one aspect of good health is your structural integrity. Healthy cardiovascular and lymphatic circulation can be a weak link for not only the most dedicated couch potato, but also the strongest athlete. Physical vitality depends in large part on a strong musculo-skeletal structure and fluid mobility of your limbs and joints. Even those who have exercised with regularity are affected by degenerative effects and stress in today's lifestyles. Over time, prolonged exposure to high-impact exercise, repetitive movements, and sedentary posturing begin to diminish the integral support of your body requires. 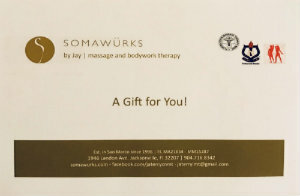 Somawürks by Jay provides an integration of massage and bodywork therapies into your physical regimen that help support continued or renewed well-being. Jay began his training at the prestigious Swedish Insitute in New York City. Shortly thereafter he moved back to his native city in Jacksonville, Florida and enrolled in the Southeastern School of Neuromuscular and Massage Therapy under the guidance of co-founder Kyle C. Wright, a nationally recognized specialist in the treatment of soft-tissue injuries and postural distortions. Following graduation Jay was additionally certified in Eric Dalton's Advanced Myoskeletal Techniques® and the Paul St. John's Method. Prior to his chosen field he worked as a strength trainer helping athletes condition for exercise and athletic competition. It was during that period he began studying the negative side effects associated with high-impact sports, repetitive movements and issues associated with sedentary lifestyles. Jay continues to study under some of the most influential leaders in neuromuscular and rehabilitative techniques, including James Waslaski (NMT, Active Release Technique®, Sports Rehabilitation), Aaron Mattes (Active Isolated Stretching®), and Rose Griscom (Institute of Thai Massage). He has worked with some of Jacksonville's most respected physical therapists, exercise physiologists, and orthopedic specialists. Jay has also lectured before numerous groups and organizations interested in noninvasive conservitive approaches to health. He has been a massage instructor for hospital wellness programs, and currently works with the Baptist | MD Anderson Wellness Center downtown, providing supportive therapies for the community and Baptist's 1,000 + allied health professionals. Jay's integrative approach and advanced techniques are available by appointment only. Somawürks by Jay is located in San Marco... a beautiful and historically significant neighborhood nestled on the south-bank of the St. Johns River and in the heart of Jacksonville, Florida. Please visit the Contact page for more information. Anytime Fitness - Lakewood Owners: Darrell and Brenda McKay. A professional exercise facility comprised of certified physical trainers, pilates instructors, and supportive health options. Melissa B. Smith, A.P. - A nationaly board certified physician in acupuncture and traditional chinese medicine. Shirley Hartman, M.D. - A medical physician offering alternative medicine and nutritional education. Baptist | MD Anderson Wellness Center - A medically and educationally based cardio-rehabilitation exercise facility, which features state-of-the-art equipment and a professional staff to help individuals maintain a physical fitness program. 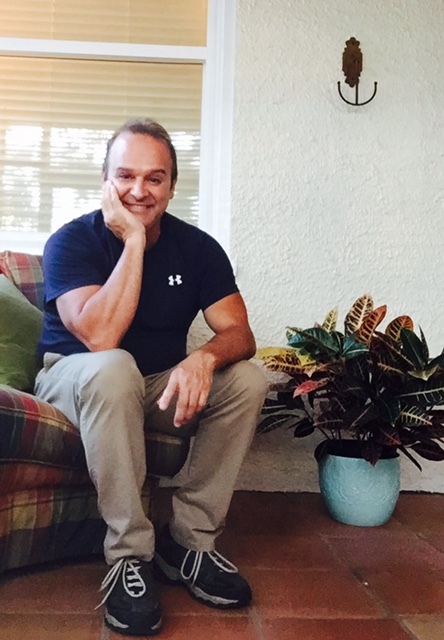 Along with physical therapists, exercise physiologists, nurses, occupational and speech therapists, Jay works there as a certified neuromuscular massage therapist. http://shawchirojax.com - A state-of-the-art chiropractic health facility based in a clinical and neuromuscular approach to well being. All new clients must complete a health intake prior to treatment. If you are receiving care under a doctor's supervision, please consult with your doctor prior to making an appointment with Jay. Should you need to cancel or reschedule your appointment, please contact Jay no later than 24 hours in advance of your scheduled appointment. Respect for time is an important aspect of care to both the massage therapist and you. And because Jay offers treatment by appointment only, it is necessary to charge the full fee for any cancellation made within the 24 hours preceding the appointment. If you arrive late for your appointment, Jay will be pleased to fulfill the remaining time on your originally scheduled appointment. You will be responsible for the full scheduled session rate. Upon request, Jay will provide a procedure coded receipt for services rendered, in order to assist you in filing for reimbursement of your expenses. Corporate or private purchased blocks of 5 or more - 1 hour massage sessions will receive a standard price reduction. And discounted rates are regularly offered during commonly recognized holidays.